The first time it happens in 2009 it takes Egyptian-American lawyer Abdalla Matthews by surprise. 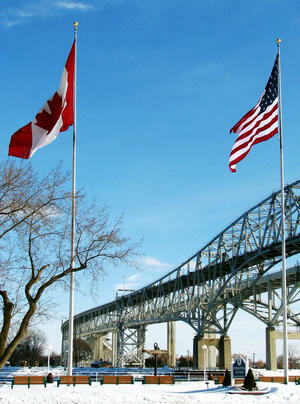 He is travelling back from Ontario with three friends, and they are crossing the Blue Water Bridge over the St. Clair river into Port Huron, Michigan. It is a cold December day, and Matthews and his friends were attending the Reviving the Islamic Spirit conference in Toronto, the largest Islamic conference in Canada (and one of the biggest in North America), meant to “revive Islamic traditions of education, tolerance, and introspection." They think everything is going fine when they pull up to the U.S. customs area. Being originally from Port Huron, Matthews has crossed the international border “a million times before,” he tells me in an interview. They aren’t expecting any problems at all. They hand their United States passports over to the blue-uniformed Customs and Border Protection (CBP) agent. After the driver steps out, Matthews hears the sharp snap of handcuffs. Disoriented, he looks around and sees more uniformed men poised, kneeling behind the car. CBP agents tell Matthews and the other two in the back seat to get out of the car. He will spend the next two hours handcuffed, in interrogation, and will be told to sit down in a room where there is only a countertop and no chair. “Can I just stand?” he asks them. In April, the Council on American Islamic Relations-Michigan (CAIR-MI) filed a lawsuit against Customs and Border Protection after receiving numerous similar complaints from U.S. American Muslims concerning “repeated handcuffing, brandishing of weapons, prolonged detentions, invasive and humiliating body searches at the border, and inappropriate questioning that pertains to religion and religious practices.” Maybe Matthews was one of the lucky ones, since others have experienced detentions of up to 10 hours. There are five plaintiffs in the lawsuit announced in April, and several testified in a press conference (see video below). In September, CAIR-Michigan increased the pressure and joined with Michigan’s Alliance for Immigration Reform to demand an investigation into Customs and Border Protection, including alleged Border Patrol racial-profiling in Latino areas in metro Detroit. The interviewer also suggested that the Muslims who are having problems at the border should “go and get an enhanced driver’s license to get through the process much easier like the rest of us. . .” His point was that the enhanced driver’s license, which also functions like a passport, was meant for more efficient cross-border travel. Matthews is one of Miller’s constituents. He grew up, went to high school, and continues to live in her district. When he hands the CBP agent his passport he feels his heart rate increase, but thinks everything is fine. He tells himself that everything will be fine. Ok, Matthews says. They handcuff him, and bring him inside to the same waiting room. The nice interrogator tells another agent to take off the handcuffs. “We’re going to clear you,” he says. Matthews sits there while they try to get clearance from the Department of Homeland Security in Washington DC. While sitting there another CBP officer approaches him. He asks Matthews the usual: Where did he go in Canada? What was the purpose? It is hard to take off your shoes, Matthews says, with your hands tied behind your back. Unable to get them off, the officer searching him kicks his feet while the two interrogators stand before him asking questions. This time they are “giving me attitude.” He is trying to answer but can’t get his shoes off and the officer continues to kick his feet, hard. When the shoes are finally off, Matthews says that the search is invasive and that they continue to interrogate while the CBP agent grabs his “belt area” around his groin. When they are done Matthews asks an agent what would happen if he circled around, reentered Canada, and came back. The agent responds that they would have to do the same exact process—detain, handcuff, and interrogate—as if it never happened the first time. Now Matthews is fearful of crossing the international divide into his own country. He thought he was a U.S. citizen, and he is, but the powerful, ever-discriminating border has made him something else. Todd Miller has researched and written about U.S.-Mexican border issues for more than 10 years. He has worked on both sides of the border for BorderLinks in Tucson, Arizona, and Witness for Peace in Oaxaca, Mexico. He now writes on border and immigration issues for NACLA Report on the Americas and its blog “Border Wars,” among other places. For more from the Border Wars blog, visit nacla.org/blog/border-wars. And now you can follow it on twitter @NACLABorderWars.